According to the media the Dutch railways are getting rid of the paper-based ticket, relying fully on a chip based prepaid card called the ov chip card. I do have such a card. However, when arriving from abroad I can't iniate this journey on a ov-chip card. I thought a paper-based ticket for international arrivals would suffice. Much to my surprise I noticed today that they were installing automatic doors, technically sealing the exits. You would need a chip card to operate the sliding doors. Today they weren't functioning yet, but I worry about future visits. How do I get out of the station with sliding doors sealing of the exits? These barriers have already been in place at some stations for some time. In the Netherlands, paper tickets (e.g. from the ticket machines) will be phased out between now and July 9. People who don't have an OV-chipkaart will then need to buy a disposable one and check in and out as well. NS announced the whole system will gradually go live after that with a handful of stations in the summer and probably 22 further stations before the end of 2014 so we will see how it works in practice very soon. The final decision on when the barriers will be put into function at all barriered stations (currently 82 are planned to be equipped with barriers out of about 400 in total) is supposed to come later. De Servicecentrale van NS opent op afstand een of meerdere poortjes. So the mains idea is to rely on barcode/QR-codes (at least one barrier per exit should be able to read them), have staff present or open barriers remotely. The page also mentions “key cards” you could get together with your ticket but it's not entirely clear to me who would give one to you. Waarbij er voorlopig nog minimaal één poortje per uitgang open blijft. This means that for the time being there will always be at least one open barrier per exit. 2015 update: The Dutch railways have introduced a reader for the self printed tickets and all international paper tickets should have a code to activate those readers as well. These are the readers for the printed tickets, which have a little window instead of the common touch field. Too bad I should avoid "making statements based on on opinion", otherwise I would have happily added a couple paragraphs. If there is no exit available to you, you can alway use the 'i' (for information) station next to the gates (shown on the right in the picture). After hitting the blue button, you should get in touch with a person stationed somewhere else, who should be able to help you. 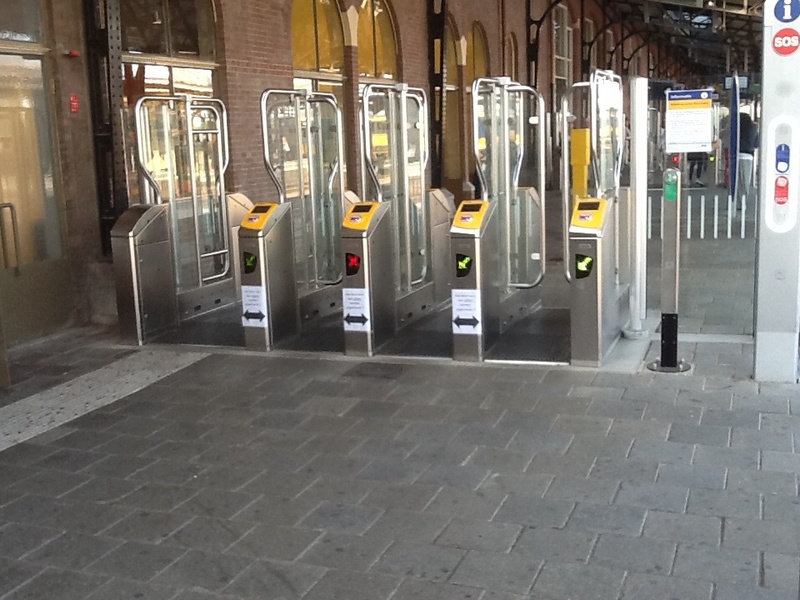 How to get in or out of an chipkaart-gated station with an e-ticket? Is it possible to buy international tickets in belgium ticket machines with open date? With a Danish train ticket, can you pause for a few hours when changing trains? Can you ride an RX train with a ticket for an R train? How to change the date of travel of a Georgian railway ticket purchased online?